If you’ve never had an opportunity to visit a factory of any kind, I can’t recommend it enough. It is fascinating to witness the almost elegant orchestration of the manufacturing process from start to finish, and the sheer amount of machinery and people involved in bringing even the simplest products to market for us all to purchase. And, of course, the dual subjects of paint and color are of particular interest to me. 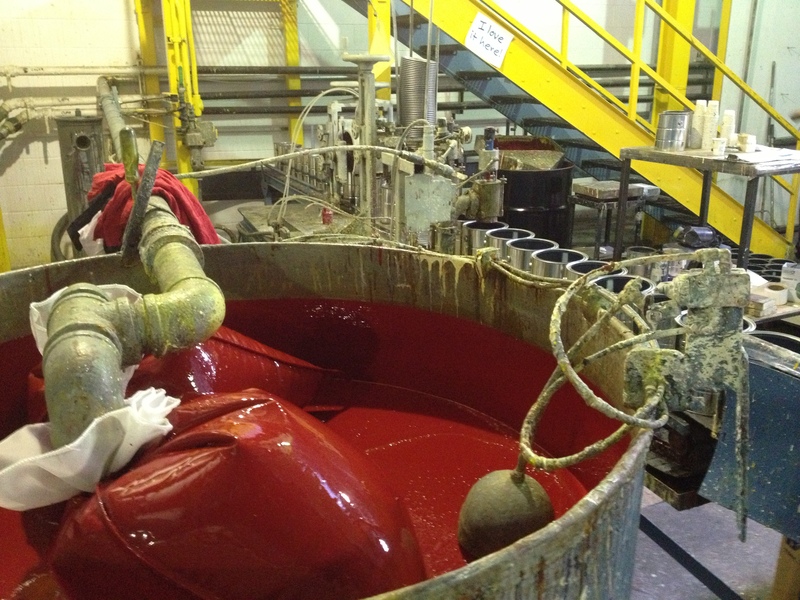 The largest “mixing vessels” on the floor hold up to 4,000 gallons of paint. This is where their different products are started and mixed. It’s like a giant KitchenAid stand mixer (mine’s been packed for weeks; I miss it 🙁 ). Paint only has three general components: pigment, solvent, and additives – with each being formulated and carefully measured based on the type of product, be it a floor paint, acrylic stain, or exterior coating (etc.). It is sort of like “baking a cake,” so I’m told – each product has it’s own recipe. The most costly ingredient? Titanium dioxide. 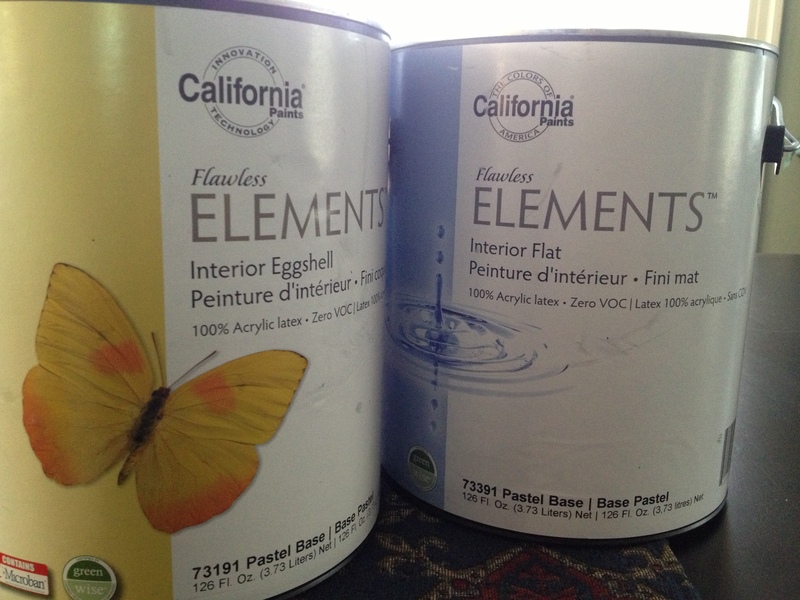 California Paints prides itself on using only the highest grade titanium dioxide, which is a pigment. It came into use in the industry after everyone figured out that white lead was highly toxic. Sad to think about all of those glamorous Victorian ladies using it to powder their noses, too. While most paint on the consumer market is mixed with tint (colorant) when you buy it at a dealer, some is pre-mixed, especially for commercial applications. 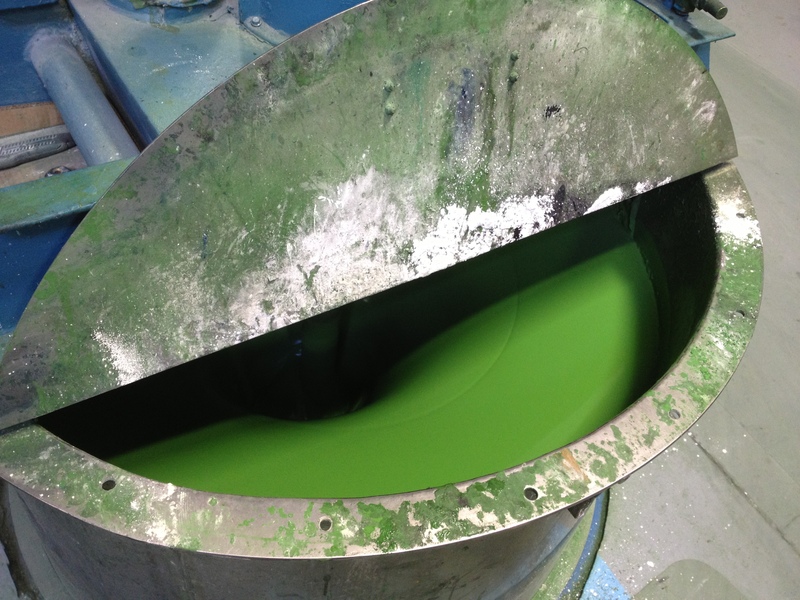 This “GO” green paint in a smaller mixing drum caught my eye. This STOP-inducing red is an oil-based paint, and is processed a bit differently than acrylic/latex coatings. The paint passes through cloth to filter out impurities. Incidentally, their alkyd (oil-based) paints are mixed and held in completely separate quarters in the plant, for safety reasons. I haven’t had a lot of exposure to alkyd paints (they’re not really used in interior applications anymore), and I have to say, the fumes are a bit overwhelming, even with the extra ventilation. The acrylic/latex areas of the plant had very minimal odor, by comparison. OK, now for my favorite part….C O L O R!! 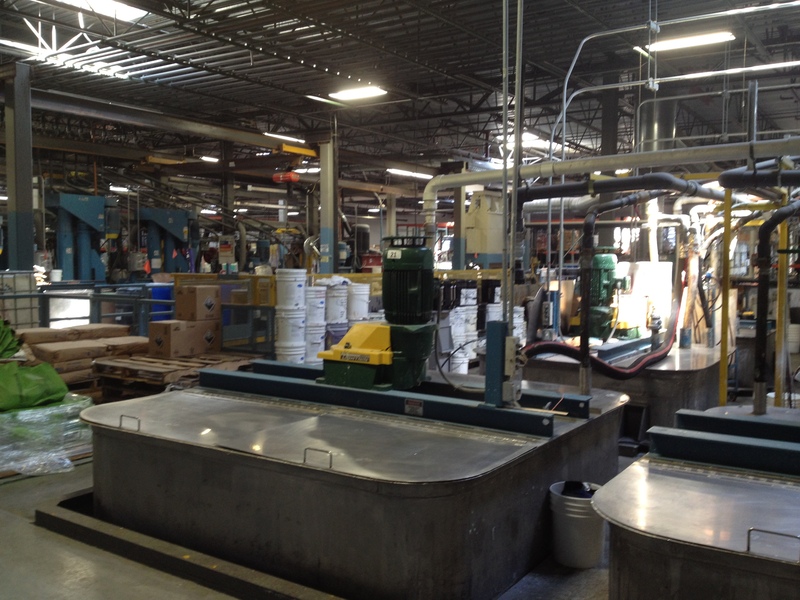 This is the tinting area of the plant, where colors are created, tested, and reformulated. California Paints recently switched over to a new tinting system called Trillion. Not only does it have zero VOCs, but it represents a significant improvement in coverage – meaning you will need, in general, less paint to complete your project. This is where the reformulation comes in – they had to recreate all of their existing ~2,000 colors with Trillion, which is much stronger than the ‘average’ colorant systems. The hibernating science nerd in me stirred a little bit this afternoon. What you see here isn’t actually paint, it’s tint – the components that give paint the color you see in a fan deck or on a color chip. There are 12 tints in a standard system, which this is (one is not visible, to the left of the pictured area). 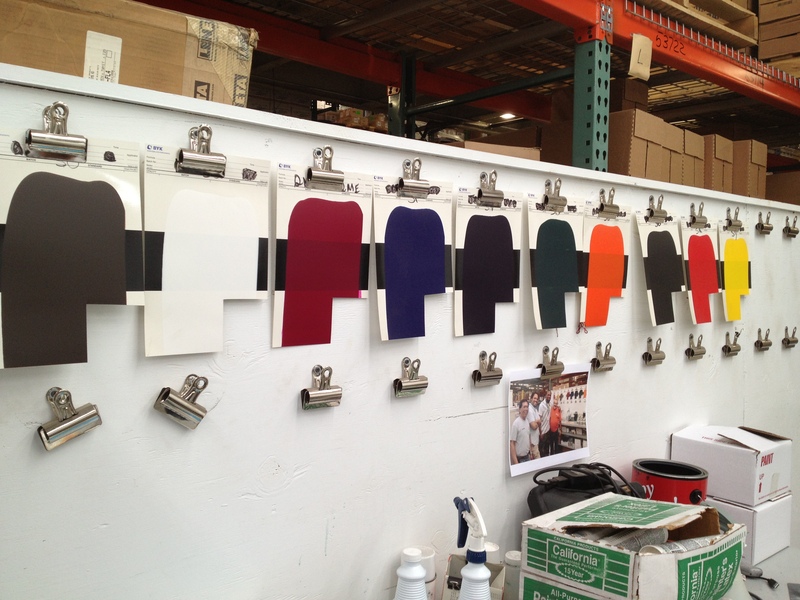 Combinations of these tints, typically 3-4 of them, are what create all of their paint colors. Note how little to none of the black strips are showing through the drawdowns (that’s what these are called). This is legit coverage. Huge thanks to Jorge, the chief tinter extraordinaire – yes, I believe that’s (not) his actual title, who was kind enough to take the time to show me this and answer my silly questions. 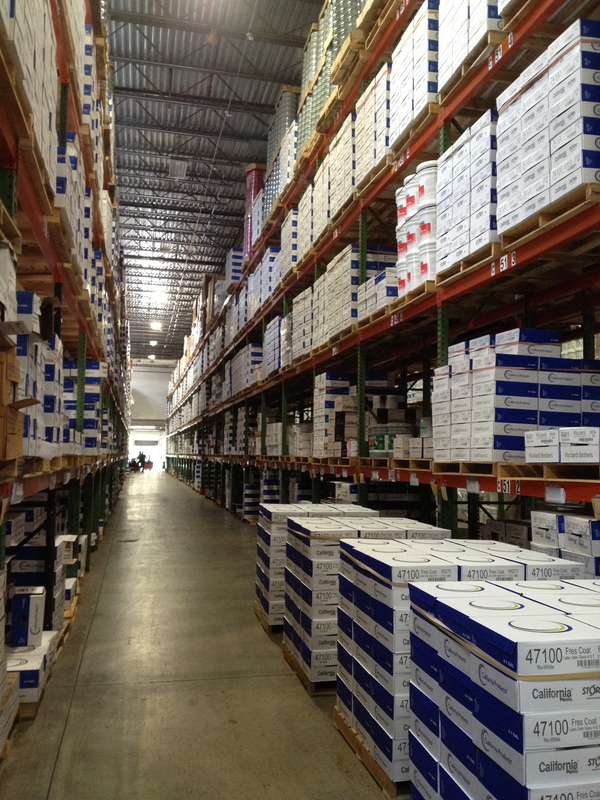 This is an awful lot of paint, palleted and awaiting shipment across the country. It totally reminded me of Costco, but with paint instead of 80-roll packages of paper towels. Touring the California Paints plant today was a real treat, and I hope you’ve enjoyed this little peek behind the scenes to learn a bit about how paint is made. Thanks, Dan – and thank you again for a killer tour! One of the things I especially love about Califorina Paints is their fan decks. So intelligently organized. Makes color selection so quick and easy, being arranged from cool to warm in each hue. I’ve been meaning to get up there for quite some time now. Maybe a summer field trip is in order. Dan, if you’re reading, will be in touch soon! This is a great post! I especially enjoy the “vats” of color. It is a shame that alkyds have such a fume problem. I really like how they perform, especially sprayed. They are quite economical in the sense that they really do not need a protective clear coat when applied as they dry hard and shiny if gloss. I have yet to see a water based paint that thins and applies like an oil based alkyd. 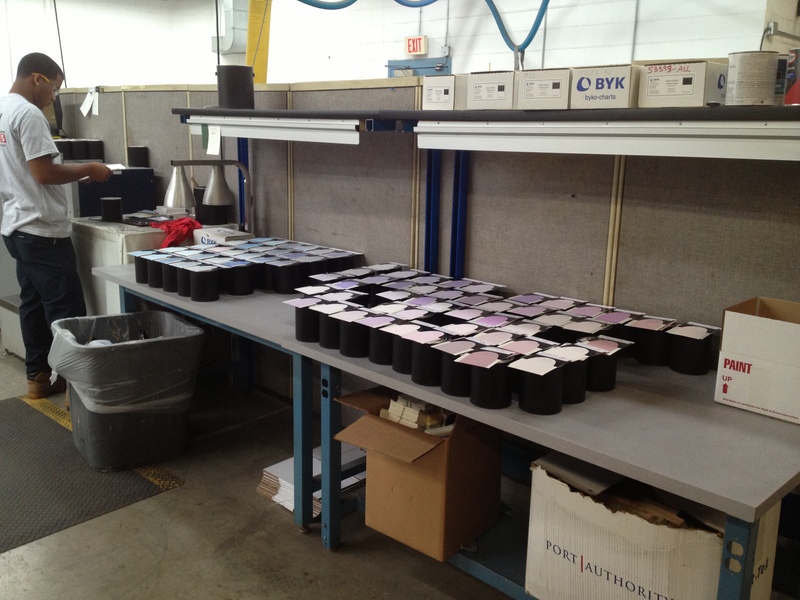 Have you ever worked with Benjamin Moore Advance? It is a waterborne alkyd that comes about as close as you can get to oil-based while keeping the VOCs and odor low. I recently used it in my home, and it was honestly lower odor even than Aura! And it performed beautifully.